Round, sweet sea scallops come from the muscle that holds the mollusk's two shells together. While scallops are naturally low in calories and fat, you can ruin a good thing by going overboard with butter. Also beware of breaded and fried scallops, which have double the calories and many times more fat. One serving of sea scallops supplies quality protein, heart-healthy omega-3 fatty acids and nutrients that support your immune system. When you're looking for a lean protein to add to your diet, put scallops on the menu. Three ounces of steamed scallops contains just 94 calories, less than 1 gram of fat and 17.5 grams of protein. This amount supplies 38 percent of women's and 31 percent of men's recommended daily allowance of protein. Together with the lean protein, you'll also gain omega-3 fatty acids. These healthy fats protect your cardiovascular health by lowering cholesterol and triglycerides. Scallops have less omega-3 than fatty fish such as salmon, tuna and sardines, but a 3-ounce serving still supplies 14 percent of women's and 9 percent of men's recommended intake. Vitamin B-12 naturally occurs in animal-based foods, and scallops are a rich source. If you don't get enough vitamin B-12, you may become anemic, because it's needed to synthesize hemoglobin for red blood cells. Your nerves and DNA need vitamin B-12 to work properly. Many substances that keep your metabolism running also depend on vitamin B-12. A 3-ounce serving of steamed sea scallops provides 75 percent of the RDA. Your immune system benefits from two minerals found in scallops: selenium and zinc. Selenium combines with amino acids to produce selenoproteins. While selenoproteins fill many jobs, including regulating thyroid hormone, they're essential for your immune system because they help regulate the immune response. The immune system also depends on zinc for the normal growth and functioning of cells that kill bacteria, cancer cells and other pathogens. Three ounces of steamed scallops contain one-third of the RDA of selenium, as well as 16 percent of women's and 12 percent of men's RDAs of zinc. The label on frozen scallops should indicate whether they were treated with a sodium solution. If you buy fresh scallops, ask whether they're dry or wet scallops. Dry scallops are preferred because they're shucked and cleaned but not treated. Wet scallops are treated with a salt solution called sodium tripolyphosphate. This is an approved preservative that makes the scallops retain more water. 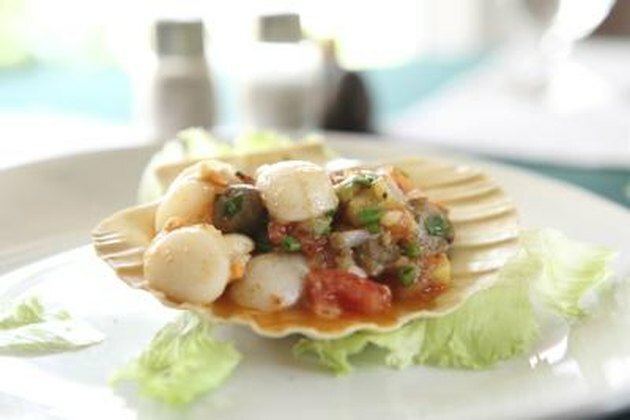 As the extra moisture evaporates during cooking, however, you may end up with small, dry scallops.